Emma is Jess's little sister . . . and her dilemma. How can one small girl be sweet, funny, imaginative, playful, and affectionate as well as a clinging vine, brat, tattletale, and nuisance–all at the same time? Why is Jess supposed to be a good big sister while Emma doesn't have to be a good little sister? The highlights and low points of this sibling relationship are insightfully evoked in short and simple poems, some funny, some touching, and all resonant with emotional truth. Every child with a younger sibling will recognize Jess's dilemma and the combination of ambivalence and deep loyalty that is built into the sibling relationship. 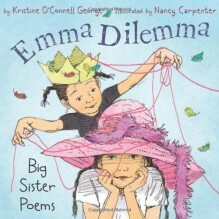 Nancy Carpenter's graceful illustrations perceptively complement Kristine O'Connell George's agile poems. A celebration of sisterhood in poetry and charming illustrations. Recommended.